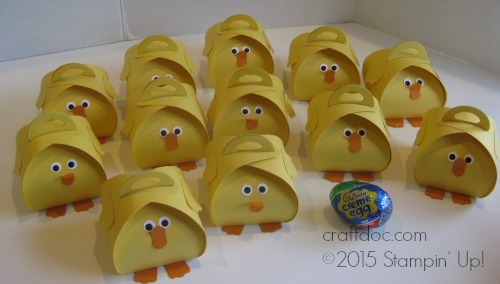 I CASED some Easter chicks that will lay Cadbury Creme Eggs for my next event. Just search for “Curvy Keepsake Box” on Pinterest for lots of fun ideas for this die. All supplies can be purchased at my website SHOP. Sale-A-Bration ends soon, so take advantage of all the deals! If your wish list is long, remember that the demonstrator starter kit is the best deal so you can get everything at a discount and enjoy the fun. – after the 2 pieces of the box are adhered, take a bone folder and curve up the ends.